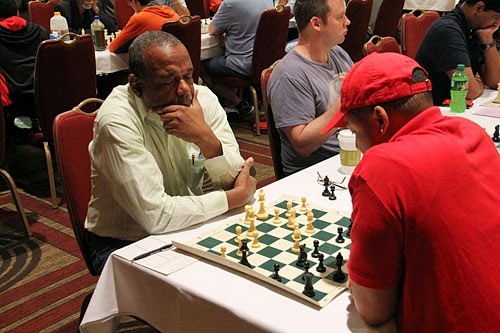 'Caribbean Tal' 7-time Barbados Chess Champion: Name him! Hello chess blog friends, here's a nice photo chess trivia for you via Chess Drum. On the left is seven-time Barbados national chess champion who is known as the “Caribbean Tal”. He has penned an excellent memoir titled, “Calypso Chess”. Can you name him? Click on the photo to visit the Chess Drum article with the answer to the chess trivia.